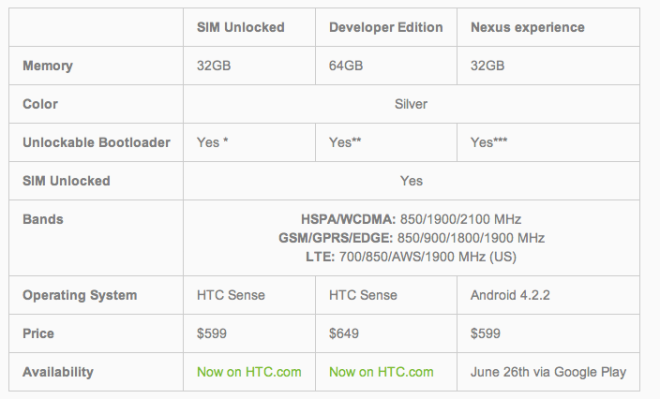 Oh HTC One fans, the “Google Edition” HTC One is officially officially…it’s really real and its coming on June 26th via Google Play for $599. The device will work on both AT&T and T-Mobile, just like its Samsung Galaxy S 4 counter-party announced at Google’s I/O conference. HTC is calling it the “HTC One with Nexus User Experience” and will come in 32GB sizing SIM-unlocked, with an unlocked bootloader. According to the HTC Blog, the HTC One Nexus User Experience does not have the 1700 band on AWS HSPA+ so T-Mobile customers in refarmed areas will be better suited for this device. Response to the HTC One has been phenomenal with reviewers praising the gorgeous design and innovative features. We’ve paired the stunning all-metal unibody with innovative HTC Sense features and the result is something truly remarkable. Now, we’re excited to offer HTC fans and admirers alike a new experience on what we think is the best hardware available today. Starting June 26, Google will offer a special edition of the HTC One with a “Nexus user experience” through the Google Play store. This special edition device, priced at $599, will be available in the United States (initially) and supported on GSM networks. Out of the box, this special edition HTC One will run Android 4.2.2 with subsequent software updates provided by Google. Was thrilled to see “vanilla” HTC One until I read it won’t support 1700 AWS band……fail. The refarmed 1900 band is too spotty and inconsistent from my experience. For those of us not tech savvy, can you explain what that means if used on Tmobile network…does it mean no hspa+…will it have lte even though thats not available right now for most? IFit could get stuck on lower speeds on Tmoble,I think that would stop a lot of people. There is no Band 4 1700 LTE support on this phone… so it’s either EDGE or 1900 refarmed only. HSPA+ aka 4G is more reliable and widespread on the 1700/2100 band which the HTC One Google Edition will NOT support. If you live in an area that TMob has refarmed the 1900 from Edge to HSPA+ then you can get 4G on the HTC One Google Edition. However in my personal experience, the refarmed 1900 HSPA+ is very unrealiable and spotty and you will be on Edge majority of the time. TLDR: HTC One Google Edition does not have full support for T Mob HSPA+. Not sure if the Google HTC One will support TMobiles LTE….. I think that HTC made a mistake with this decision. T-Mobile customers have to pay full-price for their phones anyway, so this phone will probably appeal to them more than AT&T customers. I’m assuming that this phone will be sold in more places than just the US, but HTC shouldn’t leave out 40+ million potential customers on TMUS. I’m hoping that I could use this on T-Mobile’s LTE network where I am, but I don’t know that I want to invest $600 in “hope”. My initial thought was that if I can pay the same price for the Sense version and the Google version, I’d rather get the Google version and save myself the work of rooting and ROMing. Now, I’m back to debating this. Didnt they just deny this last week? So are these phones targeted toward developers or the general public? And what does this mean to the official Nexus program if you now have a GS4 and HTC1 out there as Nexus experiences? No one denied anything. You or a developer can buy this is you want. Also, they announced a game center like service at I/O. Cloud saves, leaderboards, etc. Some games do offer a log-in option, so that you can play the game across multiple devices and stay at the same level. I’m glad to see that there are Vanilla Android versions of phones coming out. Lord knows I, personally, am not a fan of TouchWiz or Sense…or anything else companies slap on a phone. However, as a Magenta customer, I am disappointed to see that it’s not keeping up with their forward moving technology. I had heard rumors a year or so ago regarding this happening eventually. I’m extremely glad to see that it did and I hope both of these devices, S4 vanilla and One vanilla, sell extremely well. Agreed. I have to wonder if the list of AWS for HSPA+ is a typo? the Google S4 supports AWS HSPA+.. could this be a simple oversight? I think the difference here is that they’re using the AT&T HTC One for their base whereas speculation was that Samsung was using the T-Mobile S4 for their base. I can’t fathom how they could overlook this. htc is releasing the Stock software for existing owners(us), so don’t worry if you want it it’s going to be available to you. Where did you see this? Not that I doubt you but I haven’t seen this mentioned on any sites. If you have a link, please feel free to pass it on. YES!!! The HTC Nexus One’s glorious return!!!!!!!!!! More options stock vs non-stock. Awesome, I support every manufacture doing it. Consumer wins. The 1700 AWS HSPA+ Network is just too damn fast to give that up. I do not have LTE in my area as of yet and I need and want my fast data speeds. Why the hell does HTC make the phone without the T-Mobile bands, dumb, dumb, dumb. They just lost a ton of possible customers who use T-Mobile. Many Many of the developers use T-Mobile, HTC is making a bad mistake in designing this phone. Someone needs to talk with this company about the US market and the development community, they are not getting the right info. I would have bought one of these phones, just bought a new phone from T-Mobile and would have bought the HTC pure Google phone as well. Not without the T-Mobile 1700 HSPA+ . Your not in a refarmed area yet? idon’t kno bout him but i am in a refarmed area los angeles but still sucksthat this phone doesn’t support hspa on the 1700 mhz band cuz 1900 hspa is still VERY spotty over here in los Angeles i kno because i been usin a few att phones on tmobile, 1700 hspa is MUCH more stable and offers better ccoverage i kno i aint the only one i have family in NY,chicago etc that all told me the same thing 1700 hspa is much better than those refarmed 1900 areas. without the AWS band it’s hardly a slam dunk. and really, i’ve soured on a vanilla experience when it comes to removing ALL of the other features of Touchwiz and Sense . i don’t like them completely but they both have features that are really good and stripping them all is not appealing to me. like the camera. why couldn’t they keep the camera features? why couldn’t they keep a few sync features? oh well. what…the…fuuu….HTC, my wallet was open. waiting. I’ve been trying to throw money at you left and right but it’s as if you just don’t care. You’ve had a limited stock of Ones at t-mobile, making it super difficult for me to buy your product, making me consider the s4. Then you regained my interest with a nexus-like device only to say it won’t work as well as my nexus 4 which was half the price. Maybe it’s time i stopped rooting for the underdog and just brace the fact that HTC is heading out because of stupid frivilous mistakes. Agree 100%. With the new uncarrier plans T-MO customers are more likely to buy phones unlocked and HTC is just alienating them by not providing AWS on HSPA. Why doesn’t HTC listen to customers (= lack of microsd, removable battery and now lack of AWS)? No wonder they are in trouble. I look forward to the news that HSPA+ on AWS will be included. I won’t be holding my breath, however. They are installing the LTE equipment in the system next to my office right this minute (Tacoma, Wa.). So perhaps this won’t matter much? It is still bad form to not have the HSPA+ on AWS. No Band 4 LTE support… so you are out of luck both ways. You know, the TMO version of the One I am trying out currently is very clean in terms of UI, which I did not expect. I enjoy it very much. It exhibits NO lag, NO stutter, and I am only concerned about battery life. Seems SENSE tasks it the most. My Nexus 4 shows a bit of lag or stutter in basic use, so not sure this stock version of the HTC One is an advantage over the SENSE version. Unless stock improves significantly the battery life. If they change their minds about the band, I may jump on this. But then….I am intrigued by the Motorola X phone as well. Great options abound. I have a N4 and I haven’t seen lag on it… yet. But it’s really the overall experience and interface that I’m accustomed to and want from my next phone. N4 is planned for my wife, and I’d like to pick something else up. I love the N4. I was able to purchase the 2nd go round…..which lasted what…about 5 minutes? How I pulled that off I’ll never know. I have found that using the power saver function and ONLY checking CPU power results in dramatically improved battery life with no apparent negative effect on performance. Perhaps if I were into gaming it would be a factor, but I’m not. I am at 59% after 8 hrs of moderate usage- phone, email, web browsing. No AWS HSPA, no deal. No AWS 1700 is a big Mistake.. as a LARGE NUMBER of Devices that are Sold directly by Google tend to be to T-Mobile Customers, or people who MNVO’s or Pre-Paid on T-Mobile……. Also … WHERE IS THE BLACK ONE!!!!!!! WTH is HTC thinking. Selling what is basically an international version as unlocked, stock android that does not fully work on the only no-contract carrier in America. This basically is an unsullied HTC One that works only on ATT. Who would pay $600 to have an unsullied version when it’ll be $200 on contract when sense 5 is already pretty slim and will have all the optimizations on it. the people fooled by the supposed “value” of vanilla android and of course those who prefer aluminum. that’s all i can think of. i think HTC missed the mark with this one. What’s worse is that both LTE and HSPA+ will not work on T-Mobile’s Band 4 and 1700/2100 frequencies. I hope this was typo by HTC… otherwise, they are not getting my money, I’ll just buy the SGS4 and deal with their blueish pentile screen. No Band 4 1700 LTE support. If I’m lucky to find a refarmed 1900/2100 tower, I may get HSPA speeds, but majority of the time I’ll spend roaming 2G EDGE? F*ck no…I’ll take the SGS4 instead, thank you. AWS is Band 4 1700/2100. it supports LTE but not HSPA according to the screenshot. Here we go again. Go look up on any website like XDA forums that have people struggling with their HTC One developer edition phones that will not get any signal except Edge. AWS refers to the HSPA not LTE in this application. here’s the first thread to come up. confirming LTE on AWS but not HSPA+. AWS is Band 4. You’re just… wrong. lol. T-Mobile uses LTE on AWS, and this supports AWS LTE. It’s just like the older AT&T iPhone 5’s. Why are you calling the spec sheet a lie? By the way, don’t tell people to “look it up.” The burden of proof lies with you, my friend. I’ll laugh if it turns out that the stuff you saw was from people living in areas that don’t have LTE yet. LTE works fine on the developer edition on T-Mobile. As kev2684 says, AWS is Band 4 for LTE. There are tons of people on XDA reporting using T-Mobile LTE on their developer edition HTC One. I’m not sure why you keep repeating this point over and over in the comments, but you’re wrong on this. That aside, I agree that it’s stupid beyond belief that they don’t just use the already existing pentaband UMTS version of the HTC One for the stock Android phone, which is already manufactured for T-Mobile and which works on all bands for both T-Mobile and AT&T. Darn if only WiFi calling would be able to work on this model?!?!?! Another win for the Samsung Galaxy S 4 with stock Android seeing as it has AWS 3G while this doesn’t. I’m hoping that maybe, just maybe we could flash an ruu or something similar to make our current HTC ONE have a pure Google experience with out the need to root. So does this have LTE? Does the OG One even have LTE? Damn it, I wanted to get this so bad. HTC One (Global) LTE 700 / 1700 / 2100 – for T-Mobile. $600 for this???? T-mobile is selling the same phone for $580!!! I’m very surprised Google & HTC came up with this price!!! $499 would have been more reasonable. Also as a T-Mobile customer, it appears that this device isn’t fully supporting all the bands that usually comes with an unlocked device for T-Mobile. Yes, HTC and Google have dropped the ball on this deal!!! I guess, Google doesn’t want the HTC One to steal all the glory from thIs year’s upcoming Nexus phone in November. Not easy? I unlocked the bootloader on my Tmo HTC ONE in about 15 min. and it was the first time I had ever unlocked a bootloader. I think trying to sell the international version as a Nexus device just shows that HTC is on the decline as a company that builds cell phones. Maybe they can switch to making toasters? They’ll just find a reason not to include slots for the bread. The toast will not be removable. And they will only offer 1 slice, not 2 or 4 because that’s all you need. The toaster will require a wall plug adapter because it was originally intended for sale in another country. Does that mean Samsung is on the decline as well? No, Samsung used the most functional hardware version of its devices with the stock Android experience. 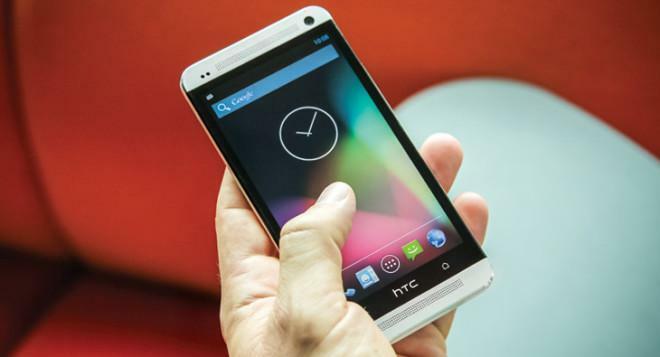 HTC picked a device that was a compromise device of their premier device (the HTC ONE). HTC does not understand the developer market. At least they didn’t try to repackage all those failed HTC First phones as developer devices. Or maybe they should but at a $200 price point. I have owned lots of HTC devices in the past including the Nexus One. I still use the HTC G2 as one of my primary phones. Anyone that falsely believes that a stock device means quicker updates is in for a surprise. The G2 which is a stock Android experience is still stuck at what Gingerbread? There is a reason HTC’s executives are leaving in droves. The ship is sinking. If you buy one of these devices, you may not ever get updates to Key Lime Pie. You are better off buying either the Nexus 4 or the Samsung device. Don’t get stuck with a “me too” product. It’s bad enough when a carrier chooses to leave off features of a device. When a manufacturer makes that choice when they have a better device available….well, that shows some incompetency. Keep in mind that the G2 still had T-Mobile bloatware and required special drivers for the physical keyboard. It was stock in appearance only. Correct, but there was no overlay. The objection that most developers have is not the crapware, but the overlay. It makes it hard to develop apps if you don’t have a stock Android device. You don’t think that the HTC One GE wont’ have any special drivers attached? Sure it will. I’m sure it will. However, HTC has officially confirmed that this phone will be updated directly by Google. This was not the case with the G2. When the GS4 Google Edition was announced at this year’s I/O, Google went on record stating that it will be updated at the same time as the Nexus devices. I may be wrong, but it seems that direct-from-Google updates is a requirement for the Google Edition branding. Don’t forget that the G2 will turn 3 years old in just 4 short months. In the world of Android, things were quite different back then. They have done this before. The G2 had the “with Google” which was only allowed for devices without an overlay (of which the G2 fits the bill). I doubt that Google will be releasing the updates for the HTC ONE GE. Most likely it will still require HTC to produce drivers for the the various components first. And with HTC’s track record, they will most likely just quietly discontinue it like they did with past devices. Don’t get me wrong, it will be a nice phone. Just let me do the “I told you so” dance when the device gets stuck on an older version of Android. Updates most likely will be limited to point updates. Don’t expect Key Lime Pie on the device. You may get screwed by Samsung as well. But at least they are supporting ALL of T-Mobile’s frequencies and therefore giving you something while you are screwed. If you want a unadultered Google experience, look elsewhere or waive your right to complain once HTC exists the phone market. Not to say they didn’t screw up, I was personally going to buy one for my girlfriend and myself, but with out AWS support its not gonna happen. A press release does not make a legal contract. Show me a legal contract that says that Google and HTC will promptly and continuously provide updates. You can’t therefore it is a “we hope to provide updates” statements. This phone is dead in the water just like HTC’s future. With that logic Google will not update any Nexus phones either. I suppose Apple won’t be updating any of their iPhones. There has never been or ever will be a guarantee of updates on any phone, what was announced here was that owners of this phone will not have to wait for HTC to optimize and integrate sense with future android releases. Google and Apple only guarantee updates during the 1 year warranty period. Google does not have a good track record either. Notice that the Nexus One which was introduced in 2010 is still stuck at Gingerbread (I also have one of these). My Nexus S, also from 2010, has been updated to Jelly Bean. With any device there will come a time when hardware limitations make it impractical to continue to update it. I’m getting the GS4, so I don’t particularly care what happens with the HTC One in the future. However, the press release can make both Google and HTC liable for willful misrepresentation, opening the door to a class action lawsuit. Show me a specific legal case in which a company was held liable for a press release. I will save you the trouble. There will not be any available since the press release would be considered preliminary since the product has not yet shipped and therefore neither HTC nor Google can agree to binding terms of a non-product. Also note that they could fill any “agreement” by issuing a point update that could do something as simple as update the user agreement stating that no further updates will be available. Just saying. We live in a world of litigation and double-speak. I wonder which carriers will offer their bloatware available for download on Google PLAY? Then they will see how much money they can save developing crAPP when there are notmany users verses money spent on each app. Wonder if Google Wallet will work on it.